Easily grown in average, dry to medium, well-drained soils in full sun. Tolerant of poor soils, drought, summer heat and humidity. Intolerant of wet soils in winter. Liatris aspera, commonly called rough blazing star, is an upright, clump-forming, Missouri native perennial which typically grows 2-3' tall (less frequently to 5') and which commonly occurs in dryish soils on prairies, open woods, glades, meadows and along roads and railroad tracks. Features rounded, fluffy, deep rose-purple flower heads (each 3/4" across) which are crowded into long, terminal flower spikes atop erect, rigid, leafy flower stalks. Stalks arise from basal tufts of rough, very narrow, lance-shaped leaves (to 12" long). Flowers open somewhat at the same time, which makes this species a particularly good fresh cut flower for floral arrangements. 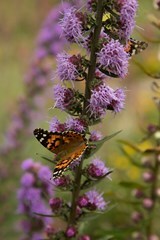 Blooms later (late summer to fall) than most other Liatris species. Liatris belongs to the aster family, with each flower head having only fluffy disk flowers (resembling "blazing stars") and no rays. This species is distinguished from other Liatris species by its rough appearance and rounded, outflaring involucral bracts. Genus name of unknown origin. No serious insect or disease problems. Taller spires may need staking. Perennial borders, cutting gardens, native plant gardens or naturalized areas.